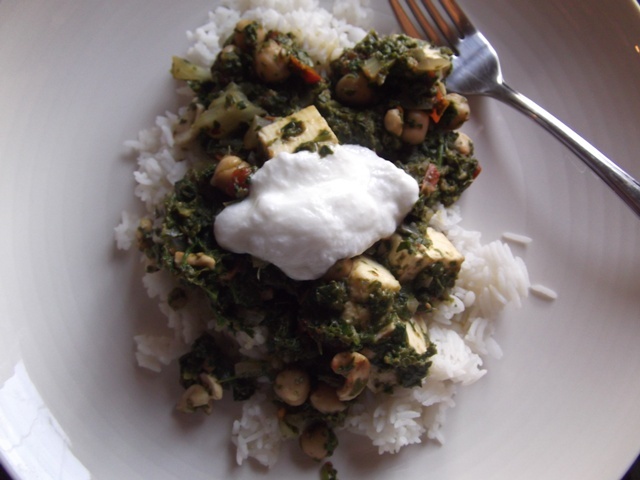 Paneer with greens and chickpeas. If you’ve recently returned home from Paris to find your diabetic husband has eaten nothing but brisket sandwiches from the BBQ place down the street since you’ve been gone, your home full of needy pets and their molted winter fur, and your own digestive system in distress, you’ll relate to this sudden need for the nourishing simplicity of stewed greens. While they simmer, you can toss out all those little containers he left behind that contain just a strand or two of coleslaw and maybe run a vacuum over the floors or the cat. If your jaw is still sore from all that ravenous mastication of so much perfect French meat, this dish will ease your suffering – you don’t have to chew too hard. Also it includes cheese. Which, if you are harbouring some variety of Space Dinosaur, means that you are addressing all of your needs in one dish and will not have to run out to the market later in the evening for a hunk of medium orange cheddar and some saltines to quell any mad cravings you might be experiencing. In your absence, he ate all the cheese. Sometimes there’s a lot going on, you know? This dish is an adaptation of Palak Paneer, one of my favourite things in the whole world which requires only the effort of finding paneer, which in Vancouver is no effort at all, or of making it. The recipe is loosely based on one I’ve made a few times from India Cookbook by Pushpesh Pant, which is a resource that I insist you get if you like to make Indian food – it’s worth it’s (dense) weight and (slightly pricey) price, even if all you do is read it and look at the gorgeous photos. The dish is generally made with spinach, but I like to throw it together with whatever’s on hand; a mix of greens is lovely and also very healthy. 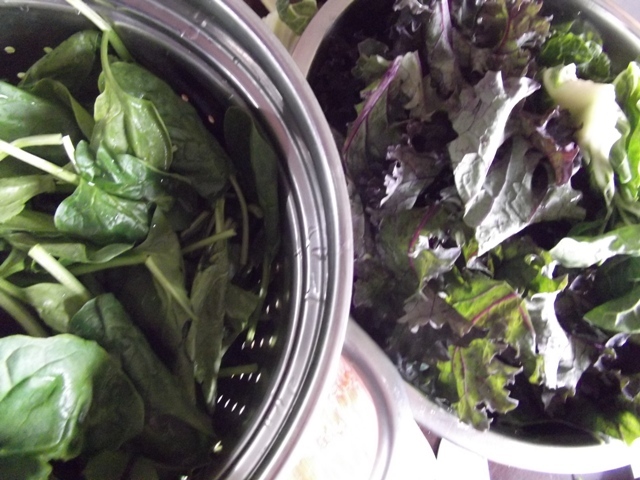 There are two ways you can start the greens, and I like both ways. You can either blanch them in boiling salted water and then purée them in a blender or food processor, or you can put them dry into the blender or food processor. If you use the blanching method, you will end up with creamy greens; if you go dry, the final product will have a bit more texture. Both ways are good, so I’ll leave that part up to you. Process greens and then set aside. In a large, heavy-bottomed pot over medium-high heat, sauté fenugreek seeds for about 30 seconds, or until fragrant. Add onion and cook until translucent. Add garlic, ginger, jalapeño peppers, cumin, salt, black pepper, and cayenne pepper, and cook for two minutes, stirring frequently. Add greens and diced tomatoes, and reduce heat to medium. Let simmer for ten minutes, adding water as needed (if you processed your greens without blanching, you may need somewhere around a cup of water) to soften the greens. Add cilantro.Taste, adjusting seasonings as required. Add chickpeas, paneer, and cashews, cook until paneer is warmed through, about two more minutes. Serve over rice with a dollop of plain yogurt. And stay tuned – more on Paris later! Get super excited for strawberry season. Oh! 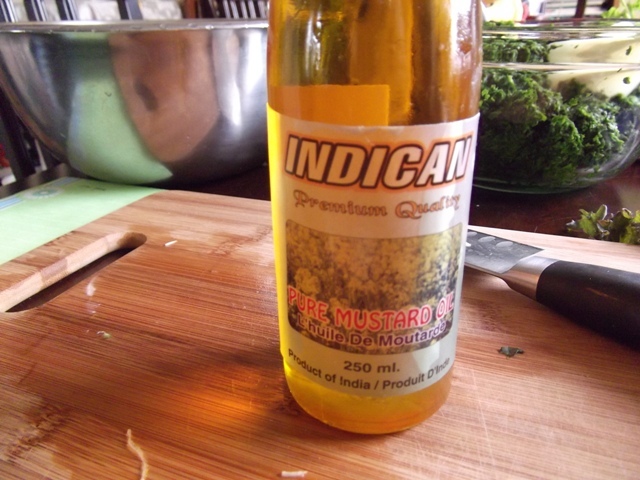 Mustard seed oil! I haven’t used it in a while. My recipe for palak panir is shockingly simple but I love the idea of yours. Also fenugreek is a galactogogue, so yay! But you be careful with it late in pregnancy, as it does something something and I don’t remember except that in the third trimester you’re supposed to limit consumption of almost everything that tastes fantastic for various reasons. Also I like to substitute inexpensive/easy-to-find/pasteurized Mexican panela cheese for the panir — it’s hardly different at all from my homemade, anyway. Love the addition of cashews and chickpeas! I WISH Mexican cheeses were super easy to find here. There really are too many rules. I was draconian with myself with respect to listeriosis risks… otherwise just tried to be informed and sensible. The hard thing was giving up so many of the risky essences in my perfume lab… as they really, really can be dangerous. (Some are ALSO spices and herbs, e.g. rosemary.) Great link!